There have been voices of dissent in the Uttarkhand Kranti Dal (P) after the Communist Party of India (CPI) and Communist Party of India (Marxist) (CPM) announced their candidate from the Tehri seat. It was a day before the UKD (P) had announced their party candidate Brij Mohan from that seat, overriding the approved list signed by the CPI and CPM leaders and the UKD (P) about which the Left leaders had aired their resentment as well, but in muted tones. The Election Commission of India (ECI) has specifically advised the observers in the five poll-bound states, including Utarakhand, to tour their respective allotted Assembly constituencies extensively and build confidence among weaker and disadvantaged sections of society. They will constantly review execution of non-bailable warrants, recovery of illicit arms and collection of licensed arms from undesirable elements. With the announcement of the Mussoorie Assembly ticket by the BJP in favour of sitting MLA Ganesh Joshi from Rajpur, the mystery shrouding the ticket allocation has ended. The BJP state headquarters today became the symbol of discontent as disenchanted party workers vented out their anger by staging a protest after being denied ticket to their candidates for contesting the Assembly elections from Dhanolti, Tehri, Sahaspur and Rajpur seats. 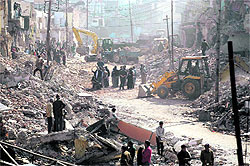 The demolition drive continued on Chakrata road even today and is expected to be completed by Wednesday morning. The drive will continue throughout the night. RVM Plaza, a tall building which has mobile towers of various companies installed on its roof, will be broken in pieces gradually. Vijay Cantt and Doon Star Club entered the final of the Amar Shaheed Kharag Bahadur Bisht Memorial Football tournament played at Nehru Gram here today. The Doon Shelters Society for the Homeless celebrated completion of two years of the local Night Shelter Home yesterday. Brig KG Behl, president of the Dehradun Ex-services League, has welcomed the Rajya Sabha Petition Committee report which has strongly recommended to the government for accepting their proposal and implementing one-rank-one pension immediately. In a tie-breaker match, Chandrabani XI defeated Gorkha Boys 4-2 in the ongoing Ram Bahadur Chhetri Memorial Football Tournament here today. The fourth auditions for the reality show “Kaun Banega Gyan Samrat” went off effectively at Laxman Inter-College here today. A large number of students from different schools of Dehradun participated in the auditions. Uttar Pradesh Red reached the semi final (Pool A) by defeating Venus Ghaziabad and Uttar Pradesh Blue during the 26th Banke Lal Shah Memorial under-15 Cricket Tournament played at the Rangers’ College ground here today. In view of the Republic Day’s celebration arrangements, a meeting chaired by chief secretary Subhash Kumar was held at the secretariat here yesterday. On the other hand, the Uttarakhand Rakhsha Morcha (URM) is also going public with the names of its candidates on 14 seats tomorrow and has blamed the UKD (P) and the Left parties for ditching them by announcing the seats, without taking it in confidence. Shailash Guleri, senior leader of the UKD (P), said: “The Left parties has always ditched us. Even last time when we had an alliance with them, they never campaigned for us. This time when they have fielded their candidate from the Tehri seat against us then there is no question of staying in alliance with them.” He said the party would not be able to gain 8 per cent vote percentage in order to be eligible to become a regional party till the Assembly elections of 2017. State secretary, CPM, Vijay Rawat said it was their district committee, which proposed and fielded their candidate Bhagvan Singh Rana from Tehri yesterday. He added that it was a mutual understanding among the constituent members of the front that more than one party could field candidates from some of the constituencies. Even the URM is considering fielding its candidate from the Tehri seat. President of the UKD (P) Trivender Singh Panwar denounced the CPM for fielding its candidate from Tehri and said he would try to dissuade it from taking a final decision on it. Spokesperson of the URM PC Thapliyal blamed the CPM for having a tacit understanding with the UKD (P) in keeping the URM outside the Uttarakhand United Regional Front (UURF). He said: “The reason the Left parties reached one hour late at the joint press conference with the UKD (P) is the CPI was insisting to take us (the URM) along at the press conference whereas the CPM was ready to go without us. The UKD (P) deceived us by announcing its seats without taking us into confidence and announcing candidate for the Lansdowne seat. The Commission has also issued directions to all the District Election Officers (DEOs) to prepare a comprehensive communication plan in consultation with observers to ensure proper and effective communication on the day of poll. These instructions were given at a briefing held in Delhi on Monday of about 1,200 observers who are being appointed to the five poll-bound states. The Commission will appoint 531 General Observers, 178 Expenditure Observers and 89 Police Observers in the five states. In his address, the Chief Election Commissioner (CEC), Dr SY Quarishi, drew the attention of the observers to their crucial role in the conduct of elections, specially their vigilance and executive functions. Dr Quraishi underlined that election management in India had become an example for the world and several countries now wished to learn skills from the ECI. Election Commissioners VS Sampath and HS Bramha pointed out the specific areas that the observers should be careful about while doing their duties. The Commission has called upon the observers to set new benchmarks in election management in the forthcoming elections through stringent observation and display of alertness and ingenuity. Observers, who are appointed under Section 20 B of the Representation of the People’s Act, 1951, act as a crucial link between the field and the Commission. These officers remain under disciplinary control of the Commission till the end of elections. Observers will be monitoring all the processes involved in the conduct of the elections to maintain its purity, including the election expenditure incurred by the contesting candidates. According to the directions of the ECI, the election observers will reach their allotted constituencies on the last date of filing of nominations and stay continuously in the constituencies assigned to them till the end of polling. “They would ensure quick redress of complaints that are received from political parties, candidates, etc. Their contact addresses and telephone numbers will be advertised in the local newspapers by the DEOs and they will set aside two hours daily (4 pm to 6 pm) at the Returning Officer’s office to meet with any person who wants to meet the observer in person and submit his or her grievance,” said a spokesperson of the Commission. The observers will supervise the process of the elections at all stages like campaign, poll, counting of votes and declaration of results. They would also be supervising randomisation, preparation of electronic voting machines (EVMs), training of polling personnel and conduct of voter awareness programmes. All observers have been advised to look into the force deployment plan in their respective constituencies. They will also be examining the identification of critical polling stations and monitoring the process of vulnerability mapping to identify the segments vulnerable to threat and intimidation. The observers have been asked to strictly monitor the enforcement of model code of conduct and have been advised to make sure that extensive videography is done of all critical events that may take place during the election process and polling at critical polling stations. The observers would be assisted by the static micro-observers who would be deployed at critical polling stations to observe and ensure the purity of the polling process. The Central Government and public sector employees would be utilised to the extent possible as micro-observers who will report to the observers. The training and orientation of micro-observers shall be the responsibility of the observers. Besides Ganesh Joshi, who has now emerged as a stronger candidate, member of the Royal family of Tehri Garhwal Tika Rani Shah, a close aide of BC Khanduri, and former Rajya Andolankari Parishad vice-president Ravinder Jugran were in the race. The state-level core committee had forwarded three names to the Central Election Parliamentary Board, which after a long discussion declared the name of Ganesh Joshi from Mussoorie. According to insiders, senior BJP leader at the Centre Murli Manohar Joshi’s “support” also helped Ganesh Joshi to win in the race of getting party ticket. Party sources believe that the survey conducted by the party on the prospects of the candidates in all Assembly segments also portrayed Ganesh Joshi as a leader with clean image and it was also one of the factors of Joshi getting the party ticket. Elated Ganesh Joshi said he had been working hard in the constituency that had been a strong bastion of the Congress from the past four years. To a query on his closeness with the senior BJP leader that led the clearance of ticket from Mussoorie, Ganesh Joshi said he had been in the party for long and had the blessing of all leaders, including Sushma Swaraj, Nitin Gadkari, Rajnath Singh and Murli Manohar . He claimed that his victory was sure from this seat irrespective of any candidate fighting against him from the Congress, including two-time sitting MLA Jot Singh Gunsola. Denouncing the distribution of party ticket, senior leader and BJP Uttarakhand state vice-president Lakhi Ram Joshi could not control his anger at being denied ticket from Tehri. “I have been at the receiving end of senior BJP leaders. In the latest move, a candidate (Dhan Singh Negi) has been given the ticket, ignoring the repercussions it would have in the elections. For the past 10 years, the Congress has had an easy ride here. Instead of coming up with a choice of a strong candidate, we have selected a candidate who even lost the last zila panchayat member election,” said a visibly angry Lakhi Ram Joshi. Joshi was an MLA from Tehri in ’91. Later, he was forced to move to Narender Nagar in the 2002 Assembly elections. He blamed Uttarakhand election campaign in charge BS Koshiyari and Agriculture Minister Trivender Singh Rawat for deliberately ignoring his claim and favouring Dhan Singh Negi. Irked BJP party workers from Dhanolti too were in a state of shock after the name of Mahavir Ragand was announced from the Dhanolti Assembly seat. The supporters of Rajesh Nautiyal, an aspirant for the Dhanolti seat, strongly criticised the distribution of ticket. “He is a former block pramukh and is close to Trivender Singh Rawat. These are the only credentials that he can claim. He has earned the reputation of a contractor and has never worked for the people of Dhanolti. We will be forced to put up independent candidate,” said a supporter of Rajesh Nautiyal. In fact, Nautiyal and his supporters publicly vented their anger by holding a demonstration and targeting party leaders. The supporters of Sports and Youth Affairs Minister Khazan Das, who has been denied ticket by the party, was seething with anger and expressed resentment against the top party leaders. “I had already informed the party about my desire to stand for elections from Rajpur, after Dhanolti was made a general seat but the party ignored my candidature,” said Khazan Das. On the other hand, Rajkumar, a sitting MLA who was hoping to get the ticket from Purola (SC), too has decided to meet with the top BJP leaders and lodge his protest. Mussoorie Dehradun Development Authority (MDDA) officials have given notice to owners of these companies to remove their towers. The traffic on the Chakrata road will open up for public tomorrow. Meanwhile, various heads of trader organisations and prominent traders of Chakrata road held a meeting in the evening to discuss the direction of the VC, MDDA, to relinquish two metres more space in the remaining part of the shops on the road. The shopkeepers decided to oppose the VC’s decision and hold talks with him on this issue on Wednesday. meters from us, they could have taken two meters more but not now, when many of us have repaired and put on shutters on the shops. The shopkeepers are tired of the demolition and want to get back to their work and start earning. Our employees, too, are jobless.” The VC is asking for extra space to resolve the parking problem. He also aimed at rooting out any possibility of encroachment on the road. Goyal said the shopkeepers on the Chakrata road never encroached on land and would not do so even now. 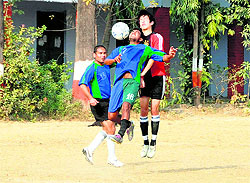 Vijay Cantt defeated Cantt Blue 2-0 while Doon Star Club beat Balaji Boys 3-0 in the semifinals of the tournament today. In the first semifinal match, Shibu of Vijay Cantt scored the first goal against Cantt Blue in the 37th minute while Jatin scored the second goal in the 61st minute. Shibu of Vijay Cantt was declared the Man of the Match. In the second semifinal, Abhishek of Doon Star Club scored two goals in the 14th minute and 55th minute while Dharmendra scored the third goal in the 69th minute to lead Doon Star Club into the final. Abhishek was adjudged the Man of the Match. The chief guest, District Magistrate, Dehradun, Dileep Jawalkar said it was admirable to provide home to the homeless and arrange education for the poor children in such homes. Such a work was related to compassion and public service. He praised the endeavours of Street Mart for providing adequate patronage and education to children who beg on streets and bringing them to the mainstream. He expressed hope that the other people and organisations would also feel inspired and come forward in this direction. On this occasion, the manager of Night Shelter Home, RS Sikand, said Night Shelter Home could accommodate 100-110 people where a fee of Rs 5 was taken from per person for a day. The beddings and blankets were provided free of cost. He said he was getting assistance from all the government departments. Additional District Magistrate Vinod Suman, Director of the Street Mart Society, and Dr Kalhan were also present. He also thanked BS Koshiyari, chairman of the committee, for presenting the report and expressed his gratitude to Rajeev Chandrasekher, member Rajya Sabha from Bangaluru, for raising the important issue and M Hamid Ansari, Vice-President of India, for admitting the point and referring it to the Petitions Committee of the Rajya Sabha. Sanjay Thapa made the first goal for Gorkha Boys in the 25th minute while Arpan scored the goal in the 50th minute for Chandrabani XI and the match was a draw 1-1. Later in the tie-breaker round, Shiv, Aman, Ankit and Deepak scored one goal each for Chandrabani XI while Sanjay and Diwakar made one goal each for Gorkha Boys. 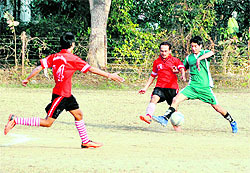 In the second match, Garhwal Sporting edged past Dehra Young 3-0. Naveen scored the first goal in the 18th minute for the winning team, followed by Vikram Rana and Abhishek Kala in the 40th and 48th minute, respectively. Doon Star will meet the Shivalik Club while Wills Youth will take on Gypsy Young tomorrow. The auditions aimed at promoting Indian culture, education, history, religion and general awareness among children by encouraging them to participate in the show. Speaking on the occasion, CP Jakhmola, principal of the college said, “Such programmes are beneficial for the overall development of students. Academics alone cannot help students grow but the extracurricular activities are equally important. The shooting for final audition would be from February 14 to 17 at Haridwar while the grand finale of the show is scheduled on February 18. The chief guest of the programme would be Mukesh Khanna. In the first match, Uttar Pradesh Red beat Venus Ghaziabad by 32 runs. After winning the toss Uttar Pradesh Red elected to bat first and scored a total of 134 runs. Himanshu and Krishna Bali were the highest scorer of the team with 34 runs and 25 runs respectively. In reply, Venus Ghaziabad scored only 102 runs (all out). Opener Pravesh scored 26 runs while Sumit also contributed to the team’s score with 19 runs in eight balls. In the second match, Uttar Pradesh Red, defeated Uttar Pradesh Blue by 37 runs. Batting first after winning the toss, Uttar Pradesh Red scored 95 runs (all out). Sagar was the top scorer with 21 runs while Saurab scored the second highest of 18 runs for the team. 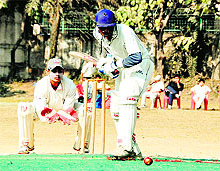 Chasing the score, Uttar Pradesh Blue team was all out for 58 runs. Nihal and Amit scored maximum runs of 17 and 14, respectively. Kumar directed that this year during the celebrations at the Parade Ground, a tableau of the Election Commission would also be presented. It would convey the message of fair casting of votes and effective election process to the public. Other departments were also given direction by the chief secretary for the special arrangements on January 26.